Crawford Bay is in the Kootenay region of southeastern British Columbia, Canada. It is approximately 1 hour north of Creston and a 1/2 hour drive, plus a 35 minute free ferry ride across Kootenay Lake when coming from Nelson. We are a 7 1/2 hour drive from Calgary, 4 hours from Spokane, Washington, and 10 hours from Vancouver. Check out our ferry landing web cam. Barefoot Handweaving is in the middle of the Crawford Bay Artisans. 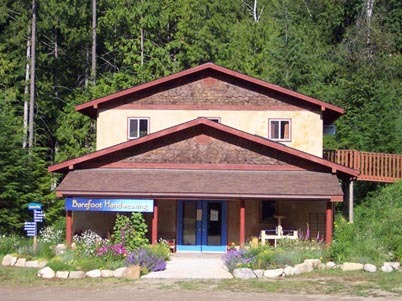 Walk south along a short path to the Forge and Furnace Gallery next door, you will find Breathless Glass, FireWorks Copper Enamel and Kootenay Forge. Across the road is Dog Patch Pottery and La Gala Jewelry, then walk north to find The Purple Door (Wizards) North Woven Brooms and back across the road for Deer Ridge Pottery. Black Salt Restaurant is open in the busy season and two pubs are there year round. This area is famous for having few people and much wilderness. Our studio is tucked back into the forest; only the front is open to the highway. We see all sorts of wildlife from the studio, including deer (sometimes too many) turkey vultures, (who sun themselves in the trees behind the shop) bald eagles, bears and ermine. In winter, there can be a lot of snow and we can cross-country ski from right outside our door. Visiting is the best way to absorb the whole experience. Watch and ask questions as we warp the looms, choose colours, weave the cloth and sew the pieces together. If you are lucky, you may catch us taking the weaving off the loom( doffing) before deciding how it will be transformed.